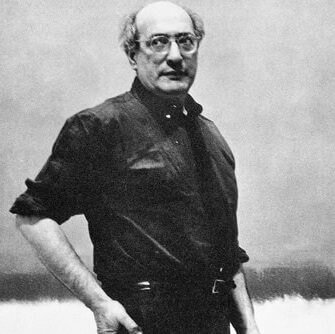 Mark Rothko was born Marcus Rothkowitz in Dvinsk, Russia (now Daugavpils, Latvia), on September 25, 1903, and immigrated to the United States with his family in his youth. In the mid-20th century, he belonged to a circle of New York-based artists (also including Willem de Kooning and Jackson Pollock) who became known as the Abstract Expressionists. His signature works, large-scale paintings of luminous colored rectangles, used simplified means to evoke emotional responses. Rothko committed s uicide on February 25, 1970. Rothko excelled at academics and graduated from Portland's Lincoln High School in 1921. He attended Yale University, studying both the liberal arts and the sciences until he left without graduating in 1923. He then moved to New York City and studied briefly at the Art Students League. In 1929 Rothko started teaching at the Center Academy of the Brooklyn Jewish Center. In 1933, Rothko's art was shown in one-person exhibitions at the Museum of Art in Portland and the Contemporary Arts Gallery in New York. During the 1930s, Rothko also exhibited with a group of modern artists who called themselves "The Ten," and he worked on federally sponsored arts projects for the Works Progress Administration. In the 1940s, Rothko's artistic subjects and style began to change. Earlier, he had been painting scenes of urban life with a sense of isolation and mystery; after World War II, he turned to timeless themes of death and survival, and to concepts drawn from ancient myths and religions. Rather than depicting the everyday world, he began to paint "biomorphic" forms that suggested otherworldly plants and creatures. He was also influenced by the art and ideas of Surrealists like Max Ernst, Salvador Dali and Joan Miro. 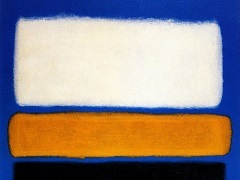 By the 1950s, Rothko's art was completely abstract. He even preferred to number his canvases, rather than giving them descriptive titles. He had arrived at his signature style: working on a large, vertical canvas, he painted several colored rectangles of color floating against a colored background. Within this formula he found endless variations of color and proportion, resulting in different moods and effects. Rothko's use of broad, simplified areas of color (rather than gestural splashes and drips of paint) caused his style to be categorized as "Colorfield Painting." He painted in thin, layered washes of color that seemed to glow from within, and his large-scale canvases were intended to be seen at close range, to that the viewer would feel engulfed by them. In the 1960s, Rothko began to paint in darker colors, especially maroon, brown and black. He received several commissions for large-scale public works during these years. One was a group of murals for the Four Seasons restaurant in New York's Seagram Building, which Rothko never completed since he withdrew from the project; another was a series of paintings for a non-denominational chapel in Houston, Texas. Rothko consulted with the chapel's architects, and the final product was the ideal space for contemplation of his stark, yet immersive, canvases.